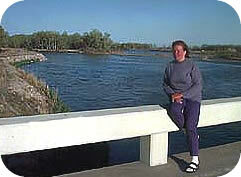 Margaret went the entire distance from Winter Quarters to Salt Lake City during the 1997 Heritage Gateway Wagon Train Re-enactment. Biography: Margaret has always thought it would be a great experience to travel where her grandparents traveled. Since she was very young, pioneer stories have been a part of family gatherings. Many of the earliest Mormon pioneers are part of her heritage. She is married to Art Clark. They have five children. Three of these children traveled the last four weeks of the trek. Margaret feels that the experiences of the pioneers should be remembered. Children today should have the opportunity to learn some of the lessons and experience some of those things that pioneers experienced. This is a great way to find out a little bit of pioneer life as it is happening.